Sift above ingredients together and put in bowl. 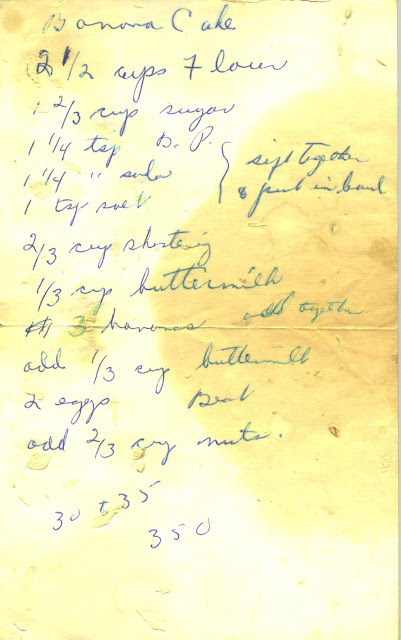 Now, the recipe indicates that the above three ingredients be added together, which I did. But then the 1/3 c. buttermilk ingredient is rewritten. I believe this is in error and when I made the banana cake I only added buttermilk once. Add 2 eggs to the wet banana mixture and beat well. Add 2/3 c. nuts. (I assume this is optional and that you may use almost any type of nut you wish. My walnut supply was rancid so I ended up using sunflower seeds, which gave the banana cake a hearty flavor but perhaps with too much saltiness for some. Once again, the recipe does not tell us what size pan to use. Very problematic! I guessed an 8x8 pan because there didn't seem to be enough batter for a 9x13. This seemed to work; however, my oven is so old and unreliable when it comes to temperature control and accuracy that the middle of the cake did not cook properly. The recipe states 30-35 minutes at 350 degrees, but I would suggest playing with the time and temp and pan size to see what works best. If I made this again, I would either try the same time with a lower temp., a larger pan (9x13), or two loaf pans which would likely reduce overall baking time. Have fun!